The Raised Feet Pose is a wonderfully simple inversion, which will decompress and release your lower back and keep you young! Also known as the Legs in the Air Pose or Uttanpadasana. As yogis know, any asana (yoga pose) that puts the legs/feet above the head is an inversion. Some inversions are very complicated and difficult, like a lot of the arm balances, the head and shoulder stands, but this particular pose is an easy and sweet way to benefit from an inversion. I love to give this mild inversion option to students in my yoga classes, instead of the difficult ones, for use when she is on her cycle, when someone has sinus issues, or when a person's body tells them that a stronger inversion is just not appropriate for her that day, if ever! Because of the rush of blood to the hips, trunk and head, do proceed cautiously if you have any of the above conditions and do not do it at all if you have eye problems. 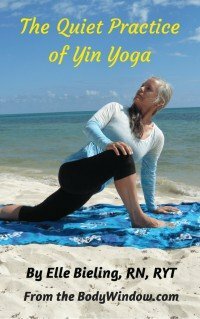 This pose releases the lower back and hamstrings and can open the ankle and knee joints as well, so if you can do it, you will reap the benefits. Begin this pose by lying on your back on the ground, as in the Corpse Pose. When you are ready, bring both knees into your chest, then straighten them so that your feet are raised and the back of your knees are moving toward a back wall, or toward a perpendicular line from the ground. If you want to do a straight leg raise, that is fine too, if your desire is to do core strengthening. If so, do several straight leg raises, up and down, as a yang to yin flow. When your legs are in the raised position, as shown in the photo below, ground your lower back by rounding it, and energetically moving your hips toward the ground. If you flex your ankles as shown, it will set the grounding feeling into your hips, while you move your hips downward. The action of the pose is more yang-like, when you actively keep your ankles flexed. However, if you focus on using only as much muscle activity as you need to feel the energy from the tops of your feet, moving down your legs, through your hips and into the ground, you can make it as Yin-like as possible. If you have sufficient hamstring opening, you can also take your big toes into your first two fingers of each hand, called your "Peace Fingers" to help to ground you, as shown in the next photo. While I am not flexible enough, nor have long enough arms to keep my legs completely perpendicular to the ground, this pose feels way more grounded and my lower back more released when I hold my toes. There is also the option to use a yoga strap to wrap around the balls of your feet, to give you an increased sensation through the hips and lower back, a greater knee joint opening and hamstring pull. If you choose the version with the yoga strap, use as little effort as possible through your neck, arms and shoulders. In the next photo, you can see the students shoulders are not grounded, and they are pulling quite hard on the yoga strap, even lifting the hips off the ground. This is the most active Yang version of the pose. and the strap should be wrapped around your hands so they do not even have to work by gripping the strap! Let the weight of your arms pull the balls of your feet downward. Only slightly send the back of your knees toward the back wall. This is the Yin way to do the Raised Feet Pose, with a yoga strap. Notice, that as you do this pose for the recommended 5 minutes, that your hips will naturally want to sink into the ground as your legs become heavier and the back of your legs will slowly release on their own. When you do the pose with a yoga strap or the peace fingers hold, you can really feel the de-efforting through the neck, shoulders and arms. In addition, this pose specifically will decompress the lower spine and relieve lower back pain! It is amazing to me, how so simple a pose has so much going on within the hold, as is true of all Yin yoga poses! We just have to learn to notice the subtle shifting over time. This would be a lovely inversion routine for you to do at home several times a week for vitality and health! Soothes the spinal column and brain for a wonderful calming effect. Did you need more reasons to do this lovely pose? Try it and you will fall in love with this pose and the inversion sequence above, like I have! May your life be filled with the calming and soothing of the Raised Feet Pose and may you live long with vitality and health! 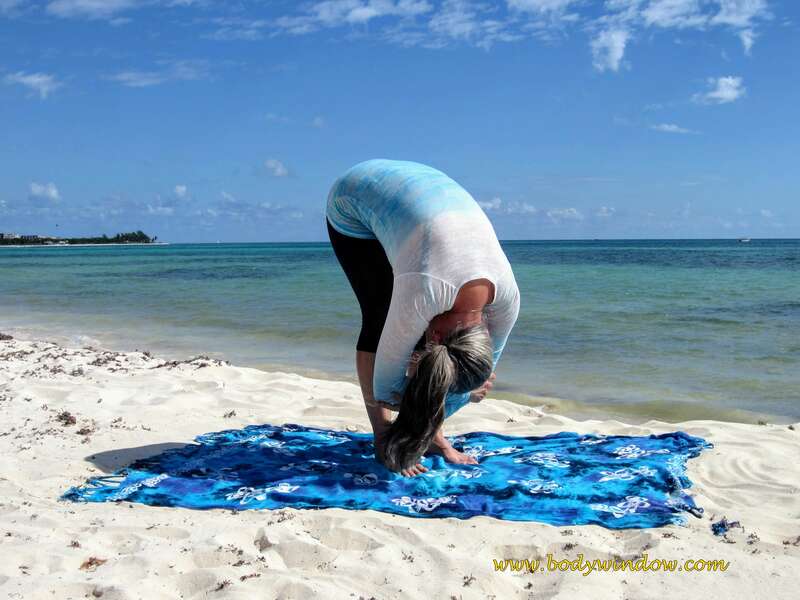 May you reconnect with your own body, mind and soul when you listen to your Body Window and practice simple inversions!